At Geek Girl Con we found an awesome vendor selling video game related soap, Digital Soaps. Sounds awesome right? You have no idea. Chrystal Doucette, is the founder of Digital Soaps and we talked for a while. She is charismatic, friendly and really open to questions about her cool products. 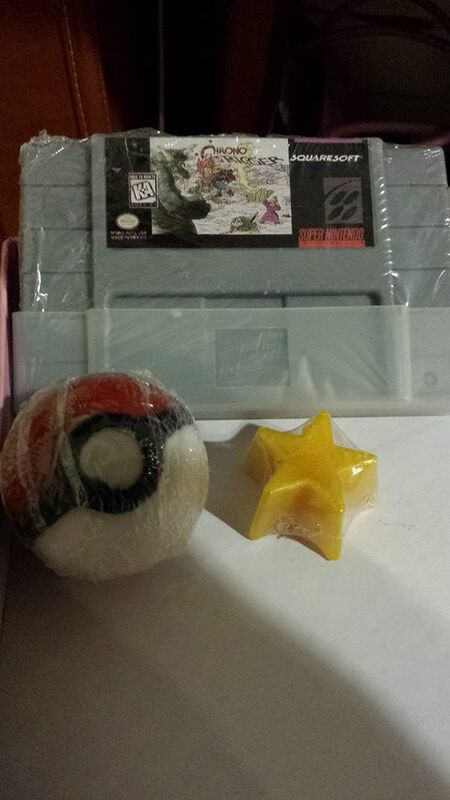 We were impressed because on first glance, her soaps looked like the real game cartridges. There were soaps of all sizes and game systems. We purchased a Chrono Trigger cartridge that is Mt. Dew Scented in fact. Yesterday I handed it to my Mother and said I bought a new game. She tried to feign interest reading the tag. Then Kane and I laughed because she commented that something smelled really nice. Even she was amazed by how much they look like the real cartridge. I also bought a deliciously smelling Pokeball. The scent is Strawberry Rhubarb pie. The ball looks like a Pokeball. According to Chrystal, there is a surprise Pokemon in each one. I can’t wait to find out what I bought. I will have to post an update after I’ve rubbed it all over enough to expose my POKEMON! I CHOOSE YOU… to wash the filth from my body and make me smell nice. As a bonus she gave us a Mario star. It’s citrus scented. Digital Soaps had other products I wanted but I thought I should start with two first. I am a little bit of a girly girl at times and I have a back log of handmade soaps. There was one that looked like a PlayStation controller. I really want the buy that next. She had a variety of scents that included Dr. Pepper and A&W Root-beer. She suggested getting the shampoo when she found out I have a pile of soaps. Her product line is very diversified. She makes body washes, soaps, lotion, hand sanitizer, shampoo and conditioners. One of the really unique items she makes is CAFFEINATED SHAMPOO. Yeah, you read that right. If you need to rise and shine, rinse and repeat. Another really cool item are the Tetris soaps. I just like the idea of being able to display them before I use them. If you really like bacon, but don’t want to rub yourself all over with it, try her soap. She makes a vegan bacon soap. They come in either dark chocolate or bacon scent. These are great gift items. I smell holiday shopping ideas! Check out her Etsy shop or her website.